Master’s degrees can be an eye-catching credential, one that can be leveraged into new positions, new career paths or even, new fields of study. Available through all types of educational institutions, including public, private for-profit and private non-profit, master’s degrees cover a gamut of specializations and topics. On the one hand, because they are topic-specific and—in many cases—geared towards specialized learning, graduate programs can as and even more expensive than undergraduate education. On the other hand, the long-term return on investment is typically worth it for master’s degree holders as they earn 20% more weekly than bachelor’s degree holders, according to 2013 data from the Bureau of Labor Statistics. For the budget conscious student, making a decision about attending graduate school is difficult at best, nearly possible at worst. The fears of getting trapped in decades-long student loan payments is at once a reality for millions of students and a real concern for future graduate students. Data from the Federal Education Budget Project of New America estimates $400 million in outstanding student loan debt is for either professional or graduate degrees. In turn, it makes sense for the prospective student to their due diligence prior to enrolling in a graduate program, and that includes understanding educational options at different tuition levels. Below is a list of the most popular master’s degree programs (by number of degrees conferred in 2013) at universities and colleges with 2013-2014 graduate tuition equal to or under $15,000. 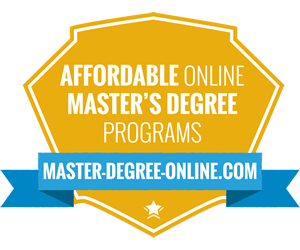 What are the most cost effective master’s degree programs? 2. The university must offer master’s degree programs in the top seven most popular fields of study: Business, Computer and Information Sciences, Education, Engineering, Health Professions, Psychology, and Public Administration/Social Services. The $1,000 - $5,000 is a very attractive price point for students and another 112 universities offer tuition in that range across the country. Examples include Utah State University, Alcorn State University, Cox College, Idaho State University, Weber State University and more. Here is an examination of the top 5 most affordable graduate degree programs (based on selection criteria mentioned above). 1. University of Massachusetts-Dartmouth. The University of Massachusetts-Dartmouth tops our list of affordable colleges, with master’s tuition just breaking $2,000. Located in North Dartmouth, Massachusetts, the college is one of four campuses of the larger University of Massachusetts. 2. University of Massachusetts-Amherst. The second most affordable master’s degree programs are available at the University of Massachusetts-Amherst. A major research university, the University of Massachusetts-Amherst, the estimated graduate student enrollment topped 6,300 students in 2013. 3. Texas A&M University-Corpus Christi. The third least expensive graduate tuition (just over $3,500) can be found at Texas A&M University-Corpus Christi. Part of the Texas A&M university system, the school is located two hours south east of San Antonio. An estimated 1,536 students were enrolled in the graduate school at Texas A&M University-Corpus Christi in 2013. The school provides a range of master’s options across 30 fields of study, such as Marine Biology, English, Business Administration and Counseling. 4. University of Wyoming. A land-grant university located in Laramie, Wyoming, the University of Wyoming offers a solid graduate education value with tuition below $4,000 ($3,780 in 2013). The graduate school has 80 master’s degree areas of study, ranging from Accounting to Zoology. 5. University of North Carolina at Charlotte. With graduate tuition of $4,008 in 2013, the University of North Carolina at Charlotte rounds out the top 5 most affordable graduate colleges. Like the other universities on the list, the University of North Carolina at Charlotte also offers a wide selection of master’s degree program tracks. Students can select from over 100 specializations, which cover everything from Chemistry to Engineering and everything in-between. The universities below cover a spectrum of locations, enrollment size and sector (e.g. Private or Public). However, they all share one trait: affordability. With tuition in the $5,000 - $10-000 range, these schools make a graduate education accessible (without breaking the bank) to most prospective students. This list of colleges and universities was the largest (40 universities) and another 394 universities offering master’s degrees with tuition in the $5,000 to $10,000 range. The sheer number of colleges providing tuition in that range indicates there is inherent value within that pricing—it is an attractive number for students and affords economic flexibility for universities to develop targeted graduate instruction. Below is a description of the top five schools that charge less than $10,000 in graduate tuition. 1. University of South Dakota. Located in Vermillion, South Dakota, the University of South Dakota is a research-focused university with a 2013 graduate enrollment of more than 2,600 students. Graduate scholars can choose from 66 study tracks, including Biology, Accounting, Art, Physics, Speech, Theatre Arts and more. 2. The University of Texas at Tyler. The second school in the $5,000 to $10,000 list, the University of Texas at Tyler had 2013 graduate tuition rates slightly above $5,300. A part of the University of Texas system, the university had a 2013 graduate enrollment of 1,735. 3. New Mexico State University-Main Campus. At number three of cost effective schools in the $5,000 to $10,000 range, New Mexico State University’s graduate tuition in 2013 was just below $5,400 ($5,398). Located in Albuquerque, New Mexico, the university had more than 3,100 graduate students enrolled in 2013. 4. Texas A&M University-College Station. The flagship University of the Texas A&M University system, Texas A&M University-College Station is one of the largest universities in the country. More than 11,600 students were enrolled in the graduate school in 2013, making Texas A&M University-College Station one of the biggest providers of graduate education in the U.S.
5. University of North Texas. A public institution located in Denton, Texas, the University of North Texas had nearly 7,000 graduate students enrolled in 2013. Graduate tuition of $5,450 and 82 master’s programs make the university stand out as an accessible, affordable option for graduate students. Master’s degree majors are available in nearly every subject area, from education to engineering, visual arts and design to business. Six universities met the criteria stated above in our $10,000 to $15,000 range, making it the smallest tier of affordable graduate colleges. Yet, even within that price range, students should find value—depending on their personal educational needs and future career goals. 1. University of Michigan-Dearborn. A satellite campus of the University of Michigan, the University of Michigan-Dearborn offers more than 40 graduate degrees in four colleges: College of Arts, Sciences and Letters; College of Business; College of Education, Health and Human Services; and the College of Engineering and Computer Science. Students can choose from a range of master’s degree concentrations, from accounting to teaching. 2. National University. Located in San Diego, California, National University is home to an additional 45 campuses throughout the United States, including Virginia, Texas and Nevada. The university is known for its selection of online programs at both the undergraduate and graduate levels. According to the university’s websites, most of its online graduate programs can typically be completed in as little as two years. 3. Walden University. A private, for-profit institution located in Minneapolis, Minnesota offers both campus- and online-based master’s degree programs. With graduate tuition less than $12,000 in 2013-2014, a graduate education could be affordable for numerous students. 5. Temple University. Located in Philadelphia, Pennsylvania, Temple University is a public institution that was founded 130 years ago. Its rich academic history continues to today, offering students graduate education opportunities through 15 colleges and departments, such as the College of Liberal Arts and the Kornberg School of Dentistry. Outside this list of six schools, another 304 universities have graduate tuition between $10,000 and $15,000. Because they did not meet our criteria of selected program offerings, they were omitted from the list. Here is an example list of universities that did not meet the criteria, but have graduate tuition below $15,000. All-told, 1,024 universities and colleges made the list and the split across institutional control lines was revealing as well. Private universities are often associated with expensive tuition rates, but—perhaps surprisingly—led the list of programs costing under $15,000 in graduate tuition. Private universities were followed by Public and then Private for-profit, which—like Private institutions—are sometimes associated with costly per credit hours and fees. However, over 100 Private for-profit universities made the list of affordable schools. Economical or expensive master’s tuition? Location. Is the location right? Would it be a better investment to move to another state or consider an online program? Academics. Is it the right program academically? Not every master’s in accounting program is the same or created equal. Faculty. Is the faculty regionally, nationally or internationally recognized? Are there opportunities to study with industry leaders? How will the choice of faculty impact future studies or career goals? Cost. Finally, cost. Is the program both affordable and academically strong? Cost is not the most important factor when it comes to making a decision about graduate school. Besides the items above, other components may weigh heavily, including school brand and name recognition, alumni, job placement rates, internships, technology and more. Taking a balanced approach, making a list of target schools and investigating the pros and cons of each should make a difference when it comes to selecting a graduate institution to attend.